The music-streaming company sold off with the market in October and kicked off November with guidance that underwhelmed investors. Shares of Spotify Technology S.A. (NYSE:SPOT) dipped 17.2% in October, according to data provided by S&P Global Market Intelligence. Selloffs for the broader market helped pull the music-streaming company's stock to a lifetime low at the end of the month. 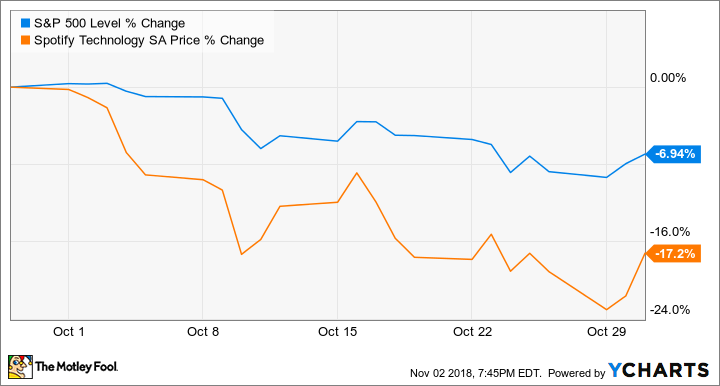 Spotify stock's October sell-offs don't appear to be tied to any company-specific news. The stock is currently down roughly 25% from the high mark of $192 that it hit in August, but it's still not far off from its price of $149 at market close on the day of its initial public offering in April. While the broader market has regained some ground in November, Spotify has sat the rebound out due to a mixed third-quarter report. The company published its earnings for the September quarter before market open on Nov. 1, and shares traded down 5.7% in the day of trading following the release. Sales for the quarter climbed 31% year over year to reach $1.54 billion. The company's monthly active users (MAUs) grew 28% year over year to 191 million, and its premium subscriber base grew 40% to 87 million members. However, Spotify's guidance for premium subscribers left some investors disappointed, with the company lowering its expected range of subscribers by roughly a million to land between 93 million and 96 million paid members. Spotify has the world's largest paid subscriber music membership base. However, as Motley Fool senior technology specialist Evan Niu recently pointed out, the platform has seen an increase in inactive premium subscribers -- which raises the possibility that some of the company's current paid members will drop their subscriptions in the near future. Spotify has been posting impressive growth, a large addressable market, and a strong brand, but the company will have to continue to navigate competition from services from larger, more resource-rich companies including Apple, Alphabet, and Amazon as well as its relationships with the major music labels.